ESPN has confirmed that Bob Davie will replace Craig James in the booth for the 2010 Alamo Bowl game between Texas Tech and Michigan State. Here is Davie's biography/profile as published by the ESPN Networks. 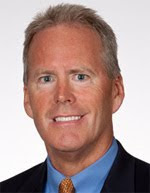 Bob Davie, a veteran college football coach of 25 years, most recently as head coach at the University of Notre Dame, serves as an analyst on college football game telecasts and select studio shows. He joined ESPN as the analyst on Saturday afternoon games in 2002 and began calling ESPN’s Saturday primetime telecast with commentator Ron Franklin and reporter Holly Rowe in 2005. He was an analyst on the debut season of the Saturday Night Football series on ABC in 2006. He also makes occasional appearances on ESPN College GameDay programs. Davie made his ESPN debut Saturday, Aug. 31 2002 at 12 p.m. when he called Central Florida at Penn State. Davie began his Notre Dame career in 1994 as a defensive coordinator and was head coach from 1997 to 2001. In 1995, he served as interim head coach while then-coach Lou Holtz was recovering from neck surgery. In his five years as head coach at Notre Dame, Davie compiled a 35-25 record, and was twice a National Coach of the Year finalist. In 1997, he became the first coach since Dan Devine in 1975 to lead the Irish to a winning record in his first year. He also led the Irish to the Independence Bowl, becoming the first rookie head coach in school history to lead the team to a bowl game. In 1998, Davie led the Irish to the Gator Bowl and a 9-3 record, tying him with Knute Rockne and Devine for most victories by an Irish coach in his second season. Notre Dame’s final bowl appearance under Davie was the Tostitos Fiesta Bowl following a 9-2 record in 2000. It was the first Bowl Championship Series game in school history. Davie’s final season with the Irish included the 2001 AFCA Academic Achievement Award as his team posted a perfect 100 percent graduation rate. He began his coaching career as a graduate assistant at the University of Pittsburgh in 1977 and at Arizona from 1978-79. He returned to Pittsburgh as linebackers coach from 1980-82 and then moved to Tulane as defensive coordinator and assistant head coach from 1983-84. Davie joined Texas A&M in 1985 where he spent his first four seasons as outside linebackers coach before serving as the defensive coordinator from 1989 to 1993. He was also the assistant head coach at Texas A&M from 1991-93. During his 20 years as an assistant coach, Davie was involved in 15 bowl games, including seven Cotton Bowls (six while at Texas A&M), two Fiesta Bowls (with Notre Dame in 1994 and with Arizona in 1979), plus one each in the Orange (Notre Dame in 1995) and Sugar (Pittsburgh in 1981) Bowls. Davie, a Sewickley, Pa. native who graduated from Youngstown State University in 1976 with a bachelor’s degree in education, was a three-year starter at tight end for Youngstown State and helped the Penguins advance to the 1974 NCAA Division II playoffs.